Opera Software released several updates for Opera 45 Developer recently that brings Telegram integration, and improvements to the Reborn redesign of the browser. 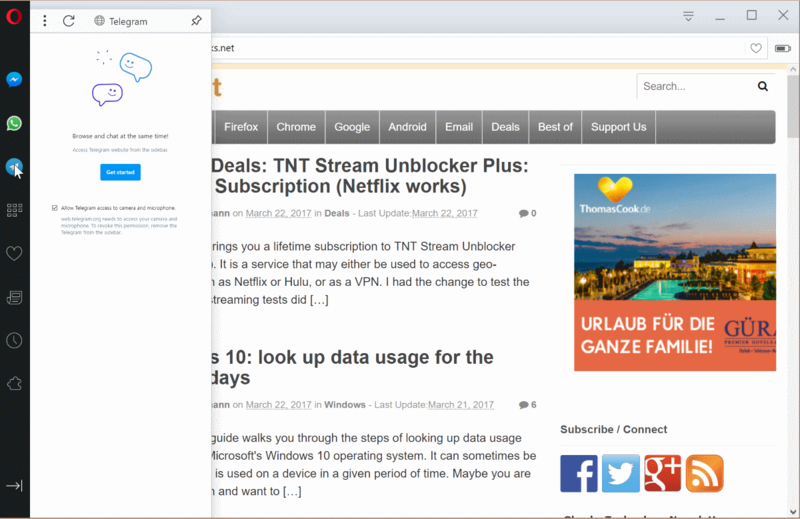 Reborn, a new design for the Opera web browser was revealed when Opera Software released Opera 44 Developer to the public. Reborn is not a complete change of the look and feel of the web browser, but a modernization of the interface without changing any of the functionality of the browser. One of the changes that came along with Reborn was support for Facebook Messenger in the browser's sidebar. The feature used the sidebar's capability to display web content in it. So, what Opera Software did was integrate the web version of Facebook Messenger in the sidebar. Later on, support for WhatsApp was introduced in a similar fashion. The most recent Developer version update of the Opera browser added Telegram Messenger support to the mix. 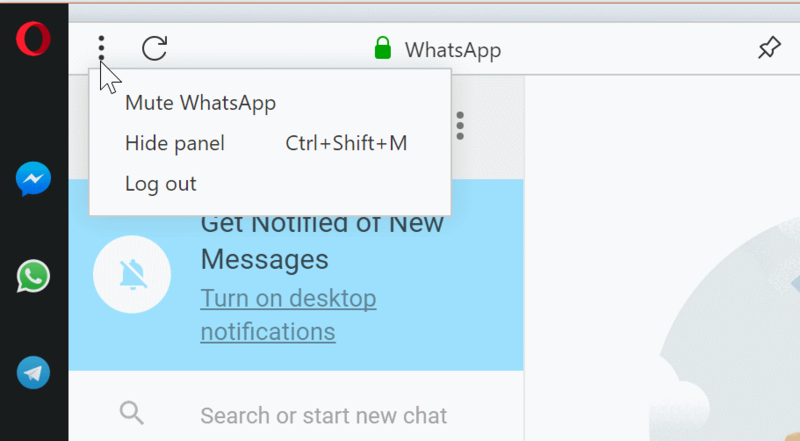 The feature works similar to Messenger and WhatsApp: it is not enabled by default, and users need to activate it by clicking on the Telegram icon, and following the process to sign in to a Telegram account using the web-based version of the messenger. Once enabled, Telegram users can interact with their contacts directly from Opera's sidebar. Opera users can hide any of the messenger icons -- and other icons -- of the sidebar by right-clicking on the sidebar and removing the checkmarks next to items that they don't want displayed there. Opera Software should consider changing the display of messenger icons in the sidebar, especially if the company considers adding more to it in future versions. The sidebar could get quite crowded if the company adds more services to the sidebar. One dedicated "chat" icon for all messengers, and the listing of all supported services on activation would probably be a better option. Another change in regards to the supported messenger services is that you can now log out of the service using a menu that Opera Software added to the interface. You had to use the web version of the service previously to do that. Click on the new menu icon (the three dots) when the chat window is open, and select the log out option there. You find options to mute the messenger there as well. The latter option is useful if you don't want to be disturbed for a period of time. Another change that Opera Software made to the browser is the new dialog that appears when you add bookmarks to the browser. 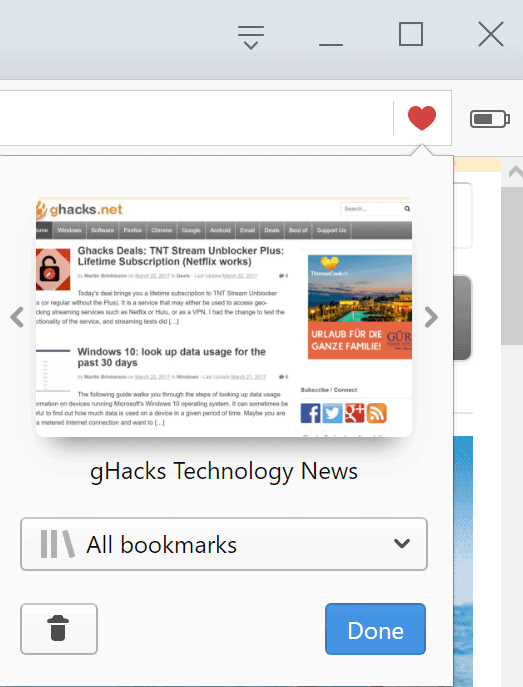 While the bookmark gets added right away, you may use the popup to change its location in the bookmarks, and get a visual confirmation that it was added to the browser. While you did get a confirmation previously as well, as Opera painted the bookmark icon in red to indicate that the page is bookmarked in the browser, it "gives a clearer way of adding bookmarks for users who missed the confirmation". A click anywhere else while the bookmark popup is open dismisses it. Opera Software notes that the browser will "send even more videos to the GPU for decoding on Windows". If it works, it should result in lower battery usage, and higher resolutions and framerates. Opera users may toggle the feature using the chrome://flags/?search=media#media-windows-mf-demuxer flag. A handful of smaller changes went into Opera 45 Developer as well. Mac users may make the sidebar smaller so that it looks like the one on Windows. This is done via Settings > Browser > Sidebar > Enable Narrow Sidebar. The browser's built-in advertising blocker was improved as well. If you toggle ad blocking now for instance, you will notice that the active page is reloaded automatically. Another important change affects the lists that Opera uses to block content on the Web. The new feature gives you control over those lists, so that you may enable or disable them. Now You: What's your take on the changes in Opera Developer? I’m really happy with it. I’m intrigued to see what other services are added to the sidebar in future updates. Nah, they shouldn’t have a chat icon there listing all services. They should just implement the same thing as Vivaldi: allowing anything to be pinned as a web panel. Opera had an option for a while to display any website in the sidebar. Opera Software simply pinned three services to the sidebar using that functionality. I don’t have any use for it, nor for Firefox’s Social API, nor for any other social “whatever” that browser developers add to their browsers. @Sören Hentzschel – Yeah, Mozilla is held to a different standard. Other browser makers get away with certain things that Mozilla is TRASHED for. I do not get the developer version so I can’t comment on it. However, did anyone notice in the new minor update to version 44, 44.0.2510.857, that the plugins menu option has disappeared? In the web site settings there is just an option to enable/disable Flash. Perhaps a bit off topic, but still pertaining to Opera. I have been playing with Opera stable for a couple of days hoping that maybe when all the extensions break in Firefox they will still work in Opera. I will summarize my findings about the browser for anyone contemplating using it. Remember this is only one person’s experience, not a lab test. I am using Windows 10 on both a Lenovo laptop with hybrid drives and a Dell laptop with only SSD. Both are 64 bit. Pro: No measurements, just that Opera seems noticeably quicker both in starting up and in loading web pages. Con: Seems to use roughly three to four times as much memory as Firefox 32 bit version (Opera stable is only available in 32 bit version). I think you need at least 6 to 8 G of RAM to be happy using it, I don’t know this for sure because I have plenty of RAM. A bit clunkier getting to bookmarks and making each website have its own amount of zoom for ease of viewing. Personal verdict: I like the snappiness and am willing to pay the memory price if that will keep my extensions for me. Note: I had a brief look at the 64 bit version of Opera. It was extremely brief as a number of convenience features were lacking and I hated that the menu button hogged up a full line of vertical space instead of being incorporated in the address bar. Firefox doesn’t appear to use that much less RAM, especially if you make it multi processed (so that it is not slow), despite what labs say. Does it matter? Not like the U.S. is proving to be any better when it comes to the privacy of the mass majority of internet users.